New washbasins, furniture, and accesories for bathroom will be presented at Bologna´s fair. On June 8, 2018, Bathco South Africa opened its doors thanks to an agreement between the Cantabrian Company and Morso Fireplaces. Bathco presents the Athenas and Iconos series of mixers that are inspired by industrial lofts from the most cosmopolitan cities in the world. Immaculate photographs and intuitive design define the new catalogue with a wide range of bathroom products divided into three sections: washbasins, sanitary ware and accessories. Alumininum is an element that stands out for its lightness and its malleability that allows to obtain unique shapes. Bathco introduces new porcelain pieces among the novelties that it presents in 2017. Silver is the sister metal of gold. It gleams and dazzles, but it does so in a different dimension than gold. Again, Bathco will participate in the International Fair for Ceramic Tiles and Bathroom Equipment, February 20 – 24th at Feria Valencia. The expectations are excellent this year. Marble, an absolute classic, reappears stronlgy as a trend in decoration. Bathco presents its new microsite with washbasin collection and projects developed at Bathco Atelier. Ana Exposito is a visual artist and graphic designer whose work, LLUVIA, belongs to Atelier Collection. 2017 is presented as a very promising year for us. BATHCO TEAM WISH YOU A MERRY CHRISTMAS AND A HAPPY NEW YEAR. Vintage & More is the new catalogue where you could discover washbasins with new patterns to decorate your bathroom. 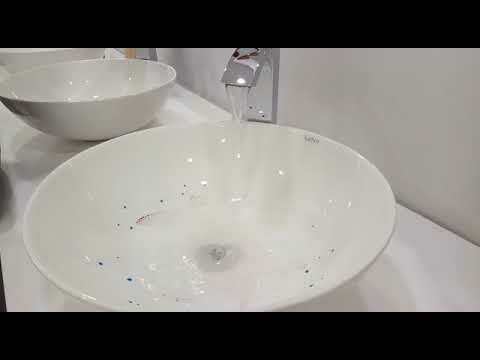 Washbasins of the Cantabrian Company will be exhibited November 21th- 24th at the most influential construction fair in the Middle East. Bathco Atelier gives you the opportunity to bring art to any space. If you liked the project that artists of our Atelier developed for the interior of a winery in Spain, now we present the work that could be part of an oceanographic centre or a museum. Golden is splendor, while marble is hardness; both are features that could sound recharged but that they are back in their most subtle way in the most current environments. Bathco has developed a redesign of its corporate image to adapt the company to the evolution of different countries where it operates. Whether in flamenco clubs between palms and heels stamping or while sounding a sensual bolero, carnations are a symbol of passion in race music. It is said that autumn has a special charm; wide color range of forest landscapes, afternoons that invite us to smell wet wood and leaves dancing with the wind. Our offices will remain closed from August 8th to 28th. If a few months ago the company announced the launch of its new corporate magazine, TREND & BATH, a quarterly publication on paper where you can find news. The bathrooms are not immune to the last trends of interior design. Our goal is to keep you updated and informed so we are happy to introduce the new magazine published by Bathco, Trend & Bath. Like any artistic piece, inside the case you will find an accreditation about the originality of the work, its care and hand made process, as well as its limited edition number. If you are thinking of giving a touch of color and vitality to the decoration of the bathroom, we offer you our rectangular washbasin Olea with FLASH pattern. Bathco´s spirit for innovation leads them to look for new sources of inspiration, exploring other fields which apparently may result alien to the bathroom sector. 25 days left for Isaloni doors opening, and Bathco will be there. Our collections will be present thanks to Regia, our distributor in Italy. Are you working on a project? Do you need a customized solution? Bathco presents the new contract catalogue, BIG PROJECTS. Bathco chose Cevisma 2016 fair to present, for the first time in Spain, the Gold & Silver Collection. In order to present our most precious collections in an attractive and functional way, we have just published catalogues for David Delfín and Mariscal collections and Big Projects. Rhodon is a washbasin in natural porcelain and hand-painted at Bathco Atelier transmits elegance and naturalness of the motifs and colors of ancient ceramics. Bathco successfully closes its participation in at the last edition of Cersaie, an exhibition that has served to refresh the market and join efforts to consolidate the sales. The fourteen pieces that have been born in the Bathco Atelier, will be exhibited for the first time, at next Cersaie edition in Bologna from September 28th to October October 2nd. Santander joins the cities that are part of the Titanic story. Bathco Atelier is a space for artistic creation driven by Bathco with the idea of developing a collection of basins where design and creativity are his trademark identity.